What do most little girls dream of becoming when they grow up? A princess, a housewife, a teacher perhaps? None of these options tempted a young girl born in North Yorkshire in 1876. Her dream was to become a soldier and when the First World War escalated, she became the only female fighter to be on the frontlines. Even in her early years, she didn’t let social stereotypes stop her from pursuing her hobbies. According to her autobiography, she enjoyed fencing and shooting and once cars were invented, she bought an old French racecar and drove it around her neighborhood. When the First World War broke out in 1914, she volunteered to become a nurse, however, she was rejected due to a lack of experience. This, obviously, did not stop her and she joined the red cross. In August 1914 she left England for the Serbian battlefield together with 36 other women. Their job was to aid in the humanitarian crises, but a year into her nursing job, Flora left her post and joined the soldiers on the frontlines. Being the only woman shooting at Austro-Hungarian soldiers and throwing hand grenades into enemy territory, she soon made a name for herself among the Serbian armed forces. She moved up in ranks rapidly. From being a private at first, she was promoted to corporal and then to sergeant-major. It wasn’t just fighting in which she proved herself as an equal to her male counterparts. Anecdotes recount how she gave her male comrades a fair game in pursuits such as car racing, smoking, drinking, and shooting. One year after she joined the battle, she was severely wounded by a grenade in hand to hand combat. She was saved by a lieutenant in her company, who saved her by risking his own life. She was given the highest decoration of the Serbian Military, the Order of the Karadorde’s Star. In the same year, she published her autobiography, An English Woman-Sergeant in the Serbian Army. Due to the severe injury she suffered from the grenade attack, she spent the remainder of the war running a hospital. 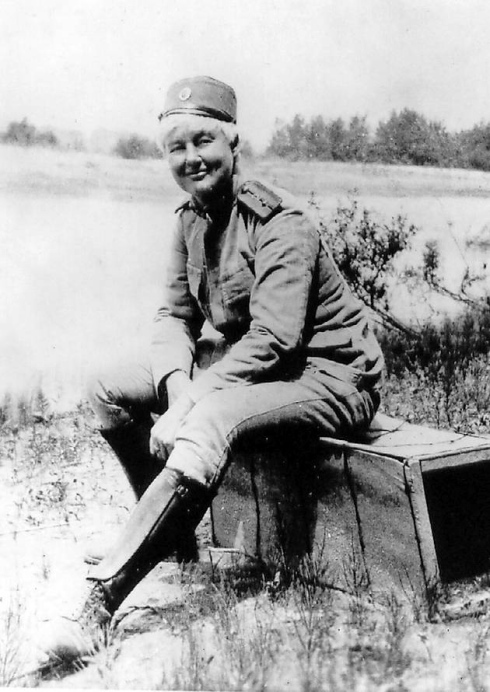 She demobilized in 1922 as the first female and first foreign officer of the Serbian army. At age 51 she married Yuri Yudenitch, an ex-pat Russian general. They lived in France for a while, but as Flora missed Serbia too much, the two of them eventually settled in Belgrade. They were both recalled to military service when the Nazis launched an attack on Yugoslavia in 1941, but the invasion was over before they were given the time to take military action. She was incarcerated by the German’s political police, the Gestapo. They questioned her for seven days before finally releasing her, but she was still ordered to report to the Gestapo once every week. After the death of her husband in 1941, due to heart failure, she moved back to England. She spent her final years touring across England, telling her story of how she became the first female Sergeant-major. She died on November 24, 1956 and was cremated in Ipswich. Flora Sandes was doubtlessly a remarkable person and her story was and remains an inspiration for women everywhere.